I use the Pingdom to check the availability of my website because it is very important to keep a website up and running all the time. So far Pingdom does an excellent job by checking my website every minute and notifying me via email or SMS after it is down consecutively for 5 minutes. During the day, I can immediately respond to the notification because my cellphone is turned on but when it comes to at night while I am sleeping, I personally do not like having a cellphone beside my bed because of the radiation emitted by the cellphone. Although some may argue that the emitted radiation is within the safe range, I just do not want to take the risk. My bedroom has a port for landline which gives me two options. The first one is to subscribe to SMS service on my landline and the second option is to use a service that can check for the down time notification and then call my landline to report about it. As for the first option, Telekom Malaysia (TM) offers such service called Homeline SMS for only RM4 per month where I can send and receive SMS from my landline. I will need to register the Homeline SMS service at TMpoint and also get a phone that supports SMS. Gigaset cordless phones by Siemens seems to be a good option because some models offers radiation-free ECO Mode Plus function. As for the second option, I found a website service called AwayFind which is able to check an email’s inbox, converts the text to speech, call up the specified number and play it to the user. So by using AwayFind service, I can get immediate notification via calls from my landline. Here are the step by step instructions on how to setup AwayFind to call me up when there is an important email. 1. Create a free AwayFind account. If you’re going to monitor your Gmail, you can sign up AwayFind using your Google Account. 2. Setup Email Accounts for AwayFind to Monitor. AwayFind supports Gmail, Exchange and IMAP. Enter your email address select the account type and click the “Add Email” button. If you’ve selected IMAP, you will need to enter the IMAP Mail Server, username, password and click the Save button. It will then try to access your email to see if it is accessible. Click the Next button. 3. The next step is to configure where to reach you with urgent emails. Click “Add a Different Method” and select “Voice Phone Call” from the drop down list. Then select your country, phone type and enter the phone number excluding the country code or numbers that starts with 0. For example in Malaysia, the country code is 60 and normally a cellphone number format is 012-345-6789 and landline is 03-4567-8901. For cellphone number, you should only enter 12-345-6789 for cellphone and 3-4567-8901 for landline. Notice that the first number 0 is being excluded. Once you’ve added the phone number, click the “Add & Send Test” button. You should receive an automated call from AwayFind robot giving you 2 random numbers to enter into the box followed by clicking the Verify button. 4. Once you’ve successfully verified your phone number, click the Next button to continue. The final step is to configure when should AwayFind alert you by specifying one person’s email or words or phrases that are present in the email subject. 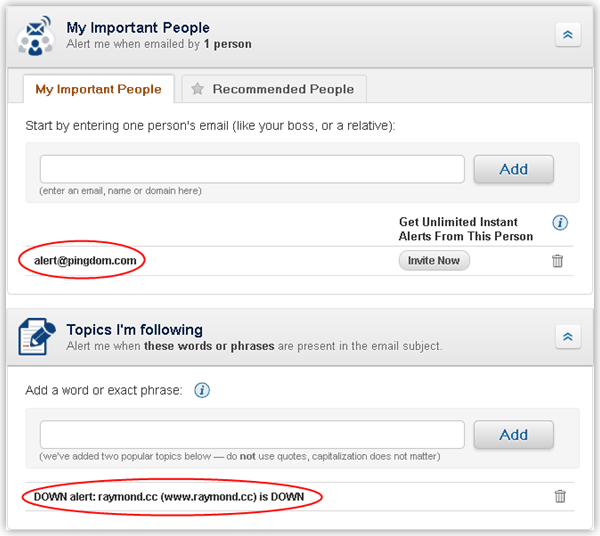 For example, I want AwayFind to alert me when Pingdom sends me a down alert, so I set alert@pingdom.com at “My Important People” and DOWN alert: raymond.cc (www.raymond.cc) is DOWN at “Topics I’m following”. Both of these information are taken from the previous Pingdom alert which I’ve received at my inbox. 5. Click the Finish Setup button and now I can receive down alerts via voice calls at night without worrying about radiation. The above scenario uses AwayFind’s service as email to voice. There are a few plans for AwayFind. Unfortunately the basic plan which is free doesn’t allow Voice calls and has a 20 minutes delay in delivery speed. Only the Pro plan that cost $14.99 per month or $149.99 per year allows voice alerts. When you create a free AwayFind account, it will automatically give you a 30 days Pro plan to test it out and then automatically reverts back to the free plan once the 30 days is up. You take such good care of your website, Raymond, and I’m always amazed to see the creative process you engage to solve a problem by finding the just-right workaround. I’ll keep this one in mind, but really just wanted to compliment you on the way you came up with this setup. Making me re-think keeping cellphone in bedroom . . . The possibility is endless when you pair up with Pingdom and AwayFind.